This is the authoritative collection of the writings of Dr. Edward I. Altman, the world's leading authority on bankruptcy, corporate distress, and defaults, and creator of the widely-used Z-Score model. This book contains both classic and never-before-published articles, along with Altman's comprehensive introduction that places all the articles in context. Edward I. Altman is the Max L. Heine Professor of Finance at the Leonar N. Stern School of Business, New York University. Since 1990, he has directed the research effort in Fixed Income and Credit Markets at the NYU Salomon Center and is currently the Vice-Director of the Center. Professor Altman is the current editor of the Handbook of Corporate Finance and the Handbook of Financial Markets and Institutions. Introduction: Corporate Bankruptcy and Financial Markets: An Overview. .
Part I: Distress Prediction Models and Some Applications. 1. Predicting Financial Distress of Companies: Revisiting the Z-Score and Zeta® Models. 2. Introducing Recursive Partitioning for Financial Classification: The Case of Financial Distress (Halina Frydman and Duen-Li Kao). 3. Corporate Distress Diagnosis: Comparisons Using Linear Discriminant Analysis and Neural Networks (The Italian Experience) (Giancarlo Marco and Franco Varetto). 4. Business Failure Classification Models: An International Survey (Paul Narayanan. 5. Emerging Market Corporate Bonds: A Scoring System (John Hartzell and Matthew Peck). 6. Managing a Return to Financial Health (James K. La Fleur). 7. Valuation, Loss Reserves, and Pricing of Commercial Loans. 8. An Economic and Statistical Analysis of The Failing Company Doctrine (Laurie S. Goodman). Part II: Credit Risk Management. 9. Credit-Risk Measurement and Management: The Ironic Challenge in the Next Decade (John B. Caouette and Paul Narayanan). 10. Credit Risk Management: Developments Over the Last 20 Years (Anthony Saunders). 11. Measuring Corporate Bond Mortality and Performance. 12. Default Rates in the Syndicated Bank Loan Market: A Mortality Analysis (Heather J. Suggitt). 13. Almost Everything You Wanted to Know About Recoveries on Defaulted Bonds (Vellore M. Kishore). 14. Do Seniority Provisions Protect Bondholders' Investments (Allan C. Eberhart). 15. Aggregate Influences on Business Failure Rates. 16. An Analysis and Critique of the BIS Proposal on Capital Adequacy and Ratings (Anthony Saunders). 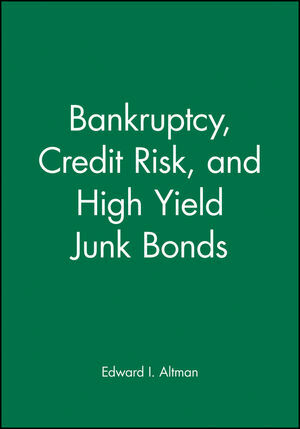 Part III: High Yield "Junk" Bonds and Distressed Securities. 17. The Default Rate Experience on High-Yield Corporate Debt (Scott A. Nammacher). 18. A Yield Premium Model for the High-Yield Debt Market (Joseph C. Bencivenga). 19. Should We Regulate Junk Bonds. 20. The High Yield Bond Market: A Decade of Assessment, Comparing 1990: with 2000. 21. The Implications of Corporate Bond Ratings Drift (Duen-Li Kao). 22. Investing in Distressed Securities: The Anatomy of Defaulted Debt and Equities. 23. Defaults and Returns on High Yield Bonds: Analysis Through 2000 and Default Outlook (Brenda Karlin). 24. Market Size and Investment Performance of Defaulted Bonds and Bank Loans: 19872000 (Keith Cyrus). Part IV: Bankruptcy and Firm Valuation. 25. A Further Empirical Investigation of the Bankruptcy Cost Question. 26. Firm Valuation and Corporate Leveraged Restructurings (Roy C. Smith). 27. Evaluating the Chapter 11 Bankruptcy-Reorganization Process. 28. Financial Distress and Restructuring Models (Yehning Chen and J. Fred Weston). The authoritative collection of writings of Dr. Edward I Altman. Contains both classic and never-before-published Articles. Places all the articles in context.